Major updates from the band. An ‘out of this world’ start to our year! We have certainly kicked off 2018 with a bang, with a great event and some exciting contest successes for all three of our brass groups over the last month. We’ve been so busy it’s taken us all month to report back! We’re going to the finals of the National Brass Band Championships of Great Britain! …and more silverware for the whole team! That wasn’t the first piece of silverware we managed to grab this year though…March arrived with all three of our bands taking part – very successfully! – in the Chichester Festival of Music, Drama and Speech. For the first time ever, Chichester City Band entered THREE ensembles to the Chichester Festival of Music, Drama and Speech, held annually at the C of E School in Orchard Street. Our Senior band has entered (and won!) for the last few years, but this was the first outing at any type of contest for our Community Band (conducted by Alan Rodger) and our Elementary brass group (conducted by Bob Ainsworth). Exam success: Not content with taking home some silverware, we congratulate 4 members of our Elementary Brass group, all of whom passed their latest exams with DISTINCTION – well done Izzy (Grade 2 trumpet), Riah (Grade 2 cornet), Mae (Grade 2 tenor horn) and Maria (Grade 1 trombone)! Well done girls – we’re really proud of you! Our day out to Chichester Festival Theatre for the presentation of the Freedom of Chichester to Major Tim Peake was even better than we could have expected. The Chichester City senior band played for the crowds arriving at the theatre to see Chichester’s favourite astronaut – it was a beautiful (if cold) sunny day, and we got a wave from the man himself as he arrived. 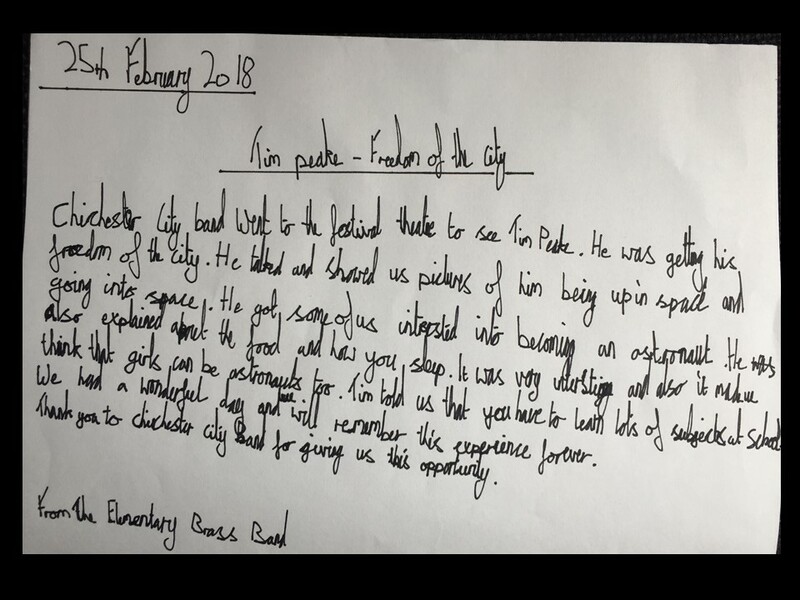 Clearly very inspired by Major Tim, Izzy (9) and twins Mae and Riah (8), all in Year 4 at the Chichester Free School, have provided us with a brief report of their day. Chichester City Band went to the Festival Theatre to see Tim Peake. He was getting his freedom of the city. He talked and showed us pictures of him being up in space and going into space. He got some of us interested into becoming an astronaut. He also explained about the food and how you sleep. It was very interesting and also made us think that girls can be astronauts too. Tim told us that you have to learn lots of subjects at school. We had a wonderful time and we will remember the experience forever. Thank you to Chichester City Band for giving us this opportunity. To find out more about all our bands, please visit the playing with the band page. Thinking about what to do on the ‘Last Friday’ of the month? Join us this coming Friday (27th October, 7.30pm) for the latest in the St. George’s Whyke ‘Last Friday Concerts’ series. It should be a great evening of popular favourites from traditional marches to West End medleys (and all sorts in between!). Interval drinks and canapés will be served. For ticket and venue information, please visit the St. George’s website. 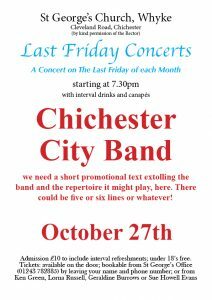 We’re looking to strengthen some sections in the contesting band so if you’re up for a new challenge please check out our Vacancies page or contact us on chichestercityband@gmail.com. We’d love to hear from you, whatever you play, but we’re particularly interested to hear from trombones, horns and cornets (positions negotiable). If you’re not interested in contesting, you’d be most welcome to come along to our Community Brass group, and any younger (or not so young) players just starting out can get a taste of ensemble playing with our Elementary Brass group. See our Playing with the Band page for more information. New venue, same great music! We recently played in a new venue for us – the Woodlands Centre in Rustington. Click here for a review of the evening! Our ‘Festival of Chichester’ concert at St Paul’s on Saturday 24th June was a great success, with performances from our Elementary Brass and Community Brass groups, as well as our Senior band. 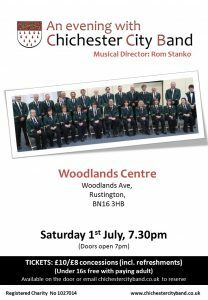 But we’re not resting on our laurels…Saturday 1st July sees the band performing again, this time at a brand new venue for us in Rustington. If you missed us at St. Paul’s (or just want to see us again!) catch us at the Woodlands Centre, Woodlands Ave, Rustington, BN16 3HB at 7.30pm. 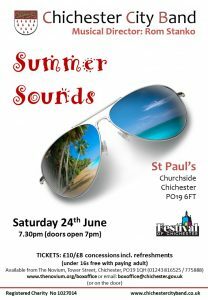 Join us for our annual summer concert at St Paul’s as part of the annual Festival of Chichester (Saturday 24th June, 7.30pm). ‘Summer Sounds’ seems a particularly appropriate theme, given the good weather we’ve been having. Enjoy the usual mix of good music, raffle and refreshments – and if the heatwave continues we can enjoy the refreshments outside in the lovely church gardens. 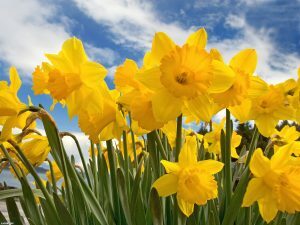 What’s on in May? Check out the diary! To start things off, we’ll be heading into Chichester city centre to start off the summer season with a free performance at Chichester Cross on May 6th – take a break from your shopping to come and say hello! Our first major event of the season follows on May 14th at the Selsey Centre with our Spring Concert. Then the fete season kicks off on May 27th at Slindon College. And that’s even BEFORE the summer starts! We hope to see you at at least a few events over the year. In the meantime, the band wishes you all a very happy Easter break! Welcome to our new MD! We ar e delighted to announce the appointment of a new Musical Director for our contesting band. Rom Stanko (M.Ed, GRNCM, NPQH, LTCL, PGCE) brings a wealth of brass playing and teaching experience, and we look forward to developing the band under his direction. 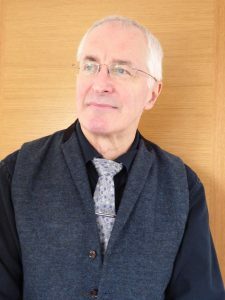 To read more about Rom’s impressive musical background, visit our Musical Director page. Wishing a Happy New Year to all of our supporters! A bit belated we know – it only seems days since we were finishing up our Christmas jobs and here we are nearly at the end of January already! We had such a busy end of year; a very successful Christmas concert (with ALL of our groups performing!) and carolling all over Chichester and surrounding areas – so we’re only just catching our breath to plan for 2017. There are lots of things going on, and lots of new dates going into the diary already, so please keep up to date with all of our news and activities by checking in here regularly. 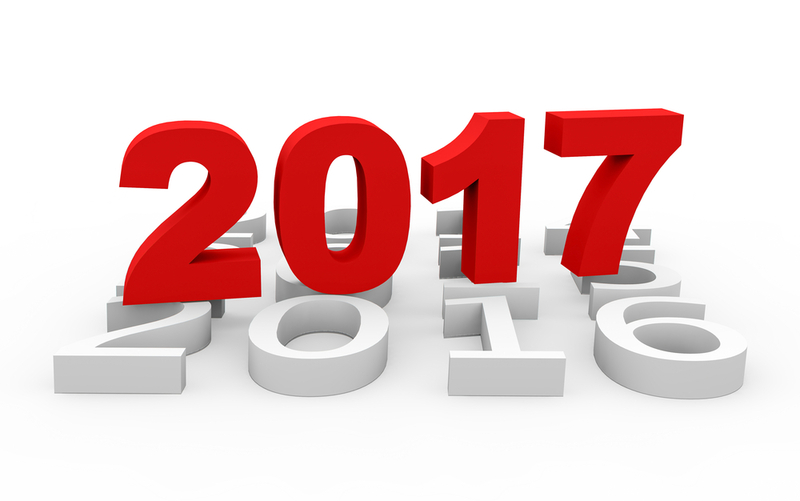 Looking forward to seeing you in 2017! We’ve already played for the lights and fireworks in Chichester, helped Chichester Lions with their Santa evening, entertained shoppers at the Weald and Downland Christmas market, and welcomed Santa Claus to the Chichester Canal Basin – and that was just one weekend in November! 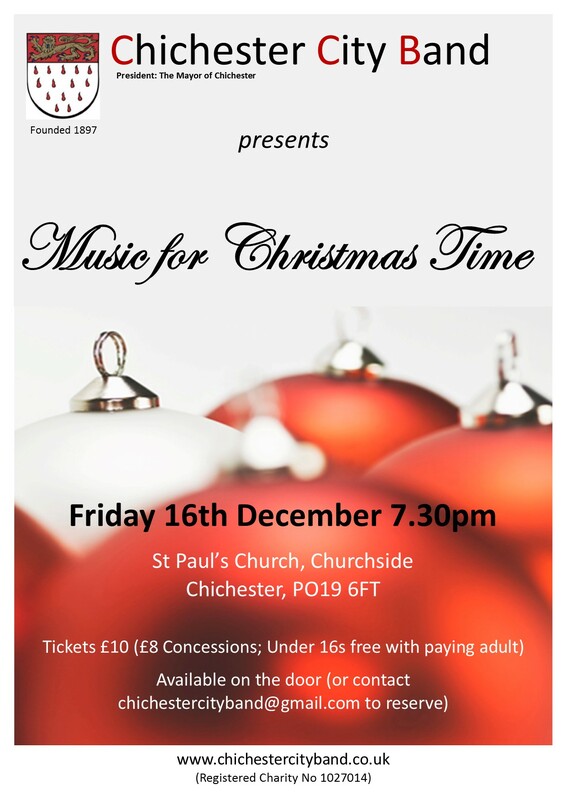 Most important date for your diary – our annual Christmas concert at St Paul’s, Churchside. Always a great evening, and we look forward to seeing you there!